This article is about the artist. For the album, see Sheryl Crow (album). Sheryl Suzanne Crow (born February 11, 1962) is an American musician, singer-songwriter and actress. Her music incorporates elements of pop, rock, country, and blues. She has released ten studio albums, four compilations, two live albums, and has contributed to a number of film soundtracks. Her songs include "All I Wanna Do", "If It Makes You Happy", "My Favorite Mistake" and the theme song for the 1997 James Bond film Tomorrow Never Dies. She has sold more than 50 million albums worldwide. Crow has garnered nine Grammy Awards (out of 32 nominations) from the National Academy of Recording Arts and Sciences. In addition to her own work, Crow has performed with the Dixie Chicks, Emmylou Harris, the Rolling Stones, Jerry Lee Lewis, Stevie Nicks, Michael Jackson, Steve Earle, Prince, Eric Clapton, Luciano Pavarotti, Willie Nelson, Smokey Robinson, John Mellencamp, B.B. King, George Strait, Tony Bennett, Kid Rock, Sting, Vince Gill, Albert Lee and Zucchero Fornaciari, among others. She has also performed backing vocals for Tina Turner, Don Henley, Stevie Nicks, Belinda Carlisle, Bob Dylan, Joe Cocker, and Neal Schon. Sheryl Suzanne Crow was born in Kennett, Missouri, the daughter of Bernice (née Cain), a piano teacher, and Wendell Wyatt Crow, a lawyer and trumpet player. Her great-grandfather was congressman Charles A. Crow (1873–1938). She has two older sisters named Kathy and Karen, and a younger brother named Steven. While studying at Kennett High School, Crow was a majorette and an all-state track athlete, medaling in the 75-meter low hurdles. She also joined the 'pep club', the National Honor Society, and the National FFA Organization, and was crowned Paperdoll Queen in a celebrity-judged beauty contest during her senior year. She then enrolled at the University of Missouri in Columbia and received a Bachelor of Arts degree in music composition, performance, and education from the School of Music. While at the university, she sang in the local band Cashmere. She was a member of the Kappa Alpha Theta sorority, Sigma Alpha Iota International Music Fraternity for Women, and the Omicron Delta Kappa Society as well as working as a 'Summer Welcome' orientation leader. Crow toured with Michael Jackson as a backing vocalist during his Bad tour 1987–1989, and often performed with Jackson on "I Just Can't Stop Loving You". She also recorded background vocals for Stevie Wonder, Belinda Carlisle and Don Henley. Crow appeared in the "New Faces" section of Rolling Stone in 1994. Tuesday Night Music Club featured many of the songs written by Crow's friends, including the second single, "Leaving Las Vegas". The album was slow to garner attention, until "All I Wanna Do" became an unexpected smash hit in the fall of 1994. As she later stated in People, she found an old poetry book in a used book store in the L.A. area and used a poem as lyrics in the song. The singles "Strong Enough" and "Can't Cry Anymore" were also released, with the first song ("Strong Enough") charting at No. 5 on Billboard and "Can't Cry Anymore" hitting the Top 40. Tuesday Night Music Club went on to sell more than 7 million copies in the U.S. and U.K. during the 1990s. The album also won Crow three Grammy Awards, in 1995: Record of the Year, Best New Artist and Best Female Vocal Performance. She performed at the 1994 and 1999 Woodstock Festivals, as well as the Another Roadside Attraction in 1997. In 1996, Crow released her self-titled second album. She produced the album herself and also played a variety of instruments, from various guitars, bass or pedal steel to various organs and piano. The debut single, "If It Makes You Happy", became a radio success and netted her two Grammy awards for Best Female Rock Vocal Performance and Best Rock Album. Other singles included "A Change Would Do You Good", "Home", and "Everyday Is a Winding Road". The album was banned from sale at Wal-Mart, because in the lyrics to "Love Is a Good Thing" Crow says that Wal-Mart sells guns to children. 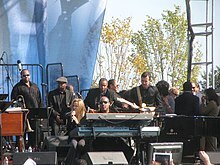 The album also features a protest song called "Redemption Day", which was covered by Johnny Cash on his last album American VI: Ain't No Grave. In 1997, Crow contributed the theme song to the James Bond film Tomorrow Never Dies. Her song "Tomorrow Never Dies" was nominated for a Grammy Award and Best Original Song Golden Globe. Crow collaborated on Scott Weiland's 1998 album, 12 Bar Blues. In 1998, Crow released The Globe Sessions. During this period, she discussed in interviews having gone through a deep depression, and there was speculation about a brief affair with Eric Clapton. The debut single from this album, "My Favorite Mistake," was rumored to be about Clapton, but Crow says otherwise—that the song is about a philandering ex-boyfriend. Crow has refused to say who the song was about, telling Billboard Magazine on the release of her album, "Oh, there will be just so much speculation, and because of that there's great safety and protection in the fact that people will be guessing so many different people and I'm the only person who will ever really know. I'm really private about who I've had relationships with, and I don't talk about them in the press. I don't even really talk about them with the people around me." Despite the difficulties in recording the album, Crow told the BBC in 2005 that, "My favorite single is 'My Favorite Mistake.' It was a lot of fun to record and it's still a lot of fun to play." The album won Best Rock Album at the 1999 Grammy Awards. It was re-released in 1999, with a bonus track, Crow's cover of the Guns N' Roses song "Sweet Child o' Mine," which was included on the soundtrack of the film Big Daddy. 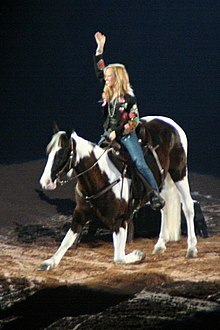 The song won the 1999 Grammy for Best Female Rock Vocal Performance. Other singles included "There Goes the Neighborhood," "Anything but Down," and "The Difficult Kind." Crow won the 2001 Grammy best female rock vocal performance for There Goes the Neighborhood. The Globe Sessions peaked at No. 5 on the Billboard 200 chart, achieving US sales of 2 million as of January 2008. In 2004, Crow appeared as a musical theater performer in the Cole Porter biographical film De-Lovely. On April 4, 2009, Crow, who practices transcendental meditation, took part in a benefit concert at the Radio City Music Hall in New York organized by the David Lynch Foundation supporting the Foundation's goal of teaching one million at-risk students to meditate. She and Ben Harper performed George Harrison’s song My Sweet Lord. Other performers at the concert included Paul McCartney, Ringo Starr, Mike Love, Moby, Eddie Vedder and Donovan. Crow said, "This event is one of the most important events to happen at this moment in history. ... Peace is something deeper than that, it is tapping into something that exists in all of us and makes us unique, and that helps us to be pure.". A&M Records released Crow's seventh studio album, 100 Miles from Memphis, on July 20, 2010. The album has a classic Memphis soul vibe and features the lead single "Summer Day." 100 Miles from Memphis (released July 20 on A&M Records), the distance from her hometown to the music mecca, is an ode to her formative memories of music – and one that the label hopes can inspire young music fans to investigate the landscape beyond processed pop and Auto-Tune. On October 11, 2011 William Shatner released the album Seeking Major Tom, on which Crow sang the track "Mrs. Major Tom" by electronic music artist KIA, released in 2003 on the album Adieu Shinjuku Zulu. Also in 2012, VH1 ranked Crow at No. 25 as one of the 100 Greatest Women in Music. In 2013, Crow signed a recording contract with Warner Music Nashville and, a few months later, released "Easy," the first single from the upcoming album, which became her first top twenty country radio hit and her highest charting lead single since 2005. Feels Like Home was released on September 10, 2013, and debuted at number seven on the Billboard 200 with first-week sales of over 36,000 copies, becoming Crow's ninth top ten album. Early in her career, Crow performed extensively with a 1962 Gibson Country Western guitar which was her personal favorite, but she eventually feared that it would not stand up to the rigors of continued touring and stage use, and in 1999 asked Gibson to build her a replica for use on stage. The manufacturer responded by introducing a "Sheryl Crow" model in their Signature Artist Series, which is essentially a re-creation of the square-shouldered 1962-era Country Western model. In 2013, Gibson also introduced a limited edition "Sheryl Crow Southern Jumbo", a reissue of the slope-shouldered predecessor of the 1962-era Country Western. Crow has had a number of high-profile romantic relationships. In the late '90s she dated musician Eric Clapton, 17 years her senior. She dated actor Owen Wilson. The song "Safe and Sound" on the album C'mon C'mon was dedicated to him and, according to the album's liner notes, was an account of their relationship. Crow began dating cyclist Lance Armstrong in 2003. The couple announced their engagement in September 2005, but jointly announced they had split on February 3, 2006. In May 2007, Crow announced on her website that she had adopted a son who was born the month before. In June 2010 Crow announced that she had adopted another boy born the previous April. She and her sons live in West Nashville, Tennessee. She also owns a home in Destin, Florida. Crow also had a loft apartment in New York City in Lower Manhattan, which she owned from 1998 to 2017. Crow was raised Presbyterian, but moved towards a more general affiliation and now describes herself as Christian. She has been awarded honorary doctorates from her Alma Mater the University of Missouri and Southeast Missouri State University in Cape Girardeau. Crow is known for her liberal political views, opposing the invasion of Iraq in 2003, supporting gun control measures, opposes military intervention in Syria, and supports fighting climate change. ^ "Sheryl Crow diagnosed with brain tumour". NME. June 6, 2012. Retrieved February 11, 2013. ^ Iley, Chrissy (March 16, 2008). "Sheryl Crow: The crow must go on". The Sunday Times. ^ "Family Lineage". Sherylcrownews.com. April 26, 2004. Retrieved December 4, 2013. ^ "The Southeast Missourian – Google News Archive Search". September 13, 2013. Archived from the original on September 13, 2013. ^ The American Bar, the Canadian Bar, the International Bar – Mary Reincke, Sylvia Stokes – Google Books. Books.google.ca. March 1, 1999. Retrieved December 4, 2013. ^ Scott, Laura (September 20, 2014). "Miss America Pageant: Memories from Kennett". The Daily Dunklin Democrat. Retrieved February 11, 2016. ^ "Sheryl Crow Sounds Off". CBS News. January 9, 2003. Retrieved June 9, 2014. ^ a b c d AllMusic.com Sheryl Crow Biography. Retrieved February 20, 2008. ^ "Late Nite – Neal Schon – Credits". AllMusic. ^ Richard Sine (August 1, 1996). "All Rocked Out". Metro Silicon Valley. Retrieved December 16, 2007. ^ "Wyn Cooper: A Serendipitous Career". Academy of American Poets. n.d. Archived from the original on August 23, 2009. Retrieved August 23, 2009. Cooper, who had been quietly stringing together teaching gigs and establishing his reputation as a poet, was soon receiving royalty checks big enough to allow him to stop working. ^ "Winners of the 1997 Grammy Awards". The New York Times. February 28, 1997. Retrieved September 9, 2013. ^ Errico, Marcus (July 10, 1996). "Wal-Mart Bans Sheryl Crow's Next Album". E!. Retrieved August 23, 2009. Wal-Mart, the nation's largest retailer, is refusing to carry Crow's upcoming album, because one song says the chain sells guns to kids. ^ "Wal-Mart Bans Album Over Gun Sale Lyrics – latimes". Los Angeles Times. September 10, 1996. Retrieved May 26, 2017. ^ "Grammy Award nominations at a glance". Turkishdailynews.com.tr. April 7, 2005. Archived from the original on November 20, 2012. Retrieved October 19, 2010. ^ "Tomorrow Never Dies (1997)". The New York Times. Retrieved October 19, 2010. ^ "review of ''The Globe Sessions'' recovered November 2, 2005". Eye.net. Archived from the original on April 16, 2005. Retrieved October 19, 2010. ^ "Transcript of BBC Radio interview with Ken Bruce. Retrieved November 2, 2005". BBC. Retrieved October 19, 2010. ^ "Sheryl Crow". MTV. Retrieved September 21, 2008. ^ "CNN.com International – Breaking, World, Business, Sports, Entertainment and Video News". CNN. Archived from the original on August 13, 2013. Retrieved April 17, 2014. ^ a b "Music Questions – Letters to the Music Editor – Ask The Music Editor". Billboard. Retrieved September 21, 2008. ^ "Be Still My Soul". Archived from the original on December 24, 2002. Retrieved June 9, 2014. ^ Susman, Gary (February 24, 2003). "Far and 'Away'". Entertainment Weekly. Retrieved October 19, 2010. ^ "Artistsnetwork.org". Artistsnetwork.org. Retrieved April 17, 2014. ^ Pareles, Jon (February 24, 2003). "Newcomer Has a Big Night at Grammy Awards Ceremony". The New York Times. Retrieved September 9, 2013. ^ Hull, Anne; Jones, Tamara (July 20, 2003). "The War After the War". The Washington Post. Retrieved July 3, 2013. ^ "Colbie Caillat and Michelle Branch to play second Azalea Festival concert". Starnewsonline.com. March 7, 2008. Retrieved October 19, 2010. ^ "CD Review: American III: Solitary Man". Countrymusic.about.com. August 4, 2010. Retrieved October 19, 2010. ^ "Whispers in the Loggia". Whispersintheloggia.blogspot.com.au. April 25, 2007. Retrieved May 26, 2017. ^ Katie Hasty, Johnson Remains No. 1; Winehouse, Hancock Soar, Billboard, February 20, 2008. ^ Marisa Laudadio (April 16, 2008). "Sheryl Crow Preps for Life on the Road with Baby Wyatt". People. Retrieved May 26, 2017. 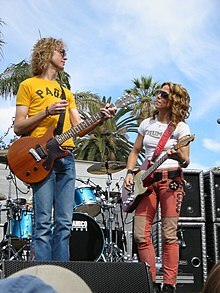 ^ "Sheryl Crow launches designer label". The Times of India. August 14, 2008. Retrieved April 17, 2014. ^ Andy Knight (August 6, 2008). "Bootheel Trading Co By Sheryl Crow". Denimology. Retrieved April 17, 2014. ^ "Sheryl Crow Interview from Change Begins Within | David Lynch Foundation Television". Dlf.tv. Retrieved April 17, 2014. ^ "Featured Past Events". David Lynch Foundation. Retrieved April 17, 2014. ^ Pareles, Jon (April 5, 2009). "Just Say 'Om': The Fab Two Give a Little Help to a Cause". The New York Times. Retrieved April 17, 2014. ^ "Sheryl Crow Drops 'Summer Day' Into the Summer Song Derby". Top40.about.com. June 4, 2010. Archived from the original on June 13, 2010. Retrieved October 19, 2010. ^ "Sheryl Crow Returns To Her Roots On '100 Miles From Memphis'". Billboard. September 14, 2009. Retrieved October 19, 2010. ^ "Sheryl Crow". TV Guide. November 2, 2010. ^ "PHOTOS: Kid Rock, Sheryl Crow at Cheyenne Frontier Days". Heyreverb.com. July 25, 2011. Retrieved September 9, 2013. ^ "SHARK – Investigations and Campaigns Against Animal Abuse". Sharkonline.org. Retrieved September 9, 2013. ^ "Sheryl Crow and Barry Levinson to Make Broadway Debuts with New Musical DINER in Fall 2012; Marshall to Direct". Broadwayworld.com. Retrieved April 17, 2014. ^ "Mark Twain Words & Music". AirPlayDirect.com. Retrieved January 15, 2015. ^ "30 Songs / 30 Days for Half the Sky | Half The Sky". Halftheskymovement.org. August 30, 2012. Archived from the original on October 14, 2012. Retrieved February 11, 2013. ^ "Hear It Here First! Katie Theme Song Revealed – Katie Couric". Katiecouric.com. July 26, 2012. Archived from the original on October 28, 2013. Retrieved September 9, 2013. ^ "Sheryl Crow Receives Daytime Emmy Nomination – Music News – ABC News Radio". Abcnewsradioonline.com. May 1, 2013. Retrieved September 9, 2013. ^ "Sherylove – Est. 1996". Sherylcrownews.com. Retrieved February 11, 2013. ^ "Sheryl Crow, 'Woman in the White House' Lyric Video". The Boot. November 6, 2012. Retrieved February 11, 2013. ^ Mark Graham (February 13, 2012). "The 100 Greatest Women in Music". VH1. Retrieved August 18, 2013. ^ Bream, Jon (August 29, 2013). "Sheryl Crow is ready for move to country music". Vindy.com. Retrieved October 29, 2013. ^ Nicholson, Jessica (May 28, 2013). "Sheryl Crow To Release 'Feels Like Home' in September". MusicRow. Retrieved May 28, 2013. ^ "First Top 20 Solo Country Release For Sheryl Crow is "Easy"". Digital Rodeo. Archived from the original on July 21, 2013. Retrieved July 24, 2013. ^ Wade Jessen (September 19, 2013). "Keith Urban's 'Fuse' Ignites on Country Charts". Billboard. Retrieved October 29, 2013. ^ Korina Lopez (September 9, 2013). "Lambert, Crow to open for George Strait final tour". USA Today. Retrieved August 3, 2014. ^ Patrick Flanary (April 10, 2014). 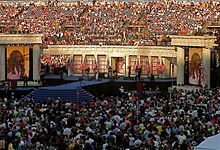 "Rock and Roll Hall of Fame: Ladies Rule Ceremony Dominated by Male Nominees". The Hollywood Reporter. Retrieved August 3, 2014. ^ Angela Stefano (May 30, 2014). "Rascal Flatts on Tour Special Guest Sheryl Crow: 'She's Already Iconic'". The Boot. Retrieved August 3, 2014. ^ Ryan Reed (May 19, 2014). "Jeff Bridges and Sheryl Crow to Co-Host Austin City Limits Benefit Gig". Rolling Stone. Retrieved August 3, 2014. ^ Hudak, Joseph (September 15, 2014). "Darius Rucker To Release Christmas Album". Rolling Stone. Retrieved September 22, 2014. ^ Grant, Sarah (December 6, 2015). "Yoko Ono, Willie Nelson, Tom Morello Star in Lennon Birthday Tribute". Rolling Stone. Retrieved May 26, 2017. ^ Lewis, Randy (March 3, 2017). "Sheryl Crow previews new album at surprise Troubadour show". Los Angeles Times. Retrieved April 7, 2017. ^ Wass, Mike (January 6, 2017). "Sheryl Crow Will Return To Her '90s Pop Roots on New LP 'Be Myself'". Idolator. Retrieved January 9, 2017. ^ Kaufman, Gil (January 5, 2017). "Sheryl Crow Seeking Unity, Going Back To Her Roots on Ninth Album". Billboard. Retrieved January 9, 2017. ^ "Willie Nelson Bringing a Bunch of Friends on Unbelievably Stacked Outlaw Music Festival Tour". Paste. Retrieved May 26, 2017. ^ Greene, Andy (January 5, 2017). "Sheryl Crow Talks Return to Nineties Roots on Upcoming LP". Rolling Stone. Retrieved January 5, 2017. ^ Fonseca, Selma (August 12, 2016). "Keith Richards, Stevie Nicks to Guest Star on Sheryl Crow's Next Album Plus More Inside Scoop". Billboard. Retrieved November 19, 2016. ^ Place, Clarissa (July 5, 2013). "Ten Things About... Owen Wilson". Digital Spy. Retrieved March 12, 2017. ^ "Lance Armstrong and Sheryl Crow Split". People. February 3, 2006. Retrieved August 24, 2012. ^ "February 2006 : Sheryl Crow has breast cancer operation". BBC News. February 25, 2006. Retrieved October 19, 2010. ^ de Bertodano, Helena (October 26, 2014). "Sheryl Crow interview: 'I've quit letting people run over me'". The Daily Telegraph. Retrieved May 3, 2018. ^ Laudadio, Marisa (June 4, 2010). "Sheryl Crow Adopts Another Son!". People. Retrieved February 4, 2019. ^ Murray, Jocelyn. "Top 10 Best Beaches on the Gulf Coast USA". Tots and Travel. Retrieved January 14, 2016. ^ Halberg, Morgan. "See the Cozy Loft Sheryl Crow Just Sold". The New York Observer. Retrieved October 16, 2017. ^ Pareles, Jon (March 31, 2017). "Sheryl Crow Checks the Mirror, and Plays What She Sees". The New York Times. ^ Roberts, Randall; Brown, August (October 4, 2017). "Will the Las Vegas massacre change country music's view of guns?". Los Angeles Times. 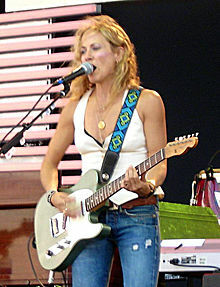 Wikimedia Commons has media related to Sheryl Crow.